This works with USBDLM as USBDLM.ini in the program install folder. You’ll need to set the VolumeSerial items to the serial numbers reported by the ‘DIR’ command in CMD, at the top of the directory listing, for each drive. The idea is that backups run directly to X drive, and then are mirrored (in StorageCraft, with ImageManager) to the Y drives, which are swapped. When restoring a volume in StorageCraft, there are several choices to make. Here is an excellent document. Appears very good, does email notification and other helpful things. Nice quality GUI. which will backup a system across network to server, via Windows share, tar over ssh/rsh/nfs, or rsync. It is very possible. Here is a good way. The purpose of the script is to actually send the email. We don’t use any built-in email capability, because to do so would make configuration much more complicated. The full text of the script is at the end of this document (as section III). You will need to modify the values for EmailSubject and EmailBody to match the site at which the server is located, and put this modified copy in a good safe location on the server. The script is pre-configured for gmail. For other ISPs you may need to modify the TCP/IP email port number and/or turn SSL off. This example will use the location “C:\0DCST\bin”, and the script file name “ReportBackupFailureByEmail.vbs”. II Insert the script into the Task Scheduler. 1. Open up Task Scheduler, and view the Task Scheduler Library. Enter a name and description for your new task. 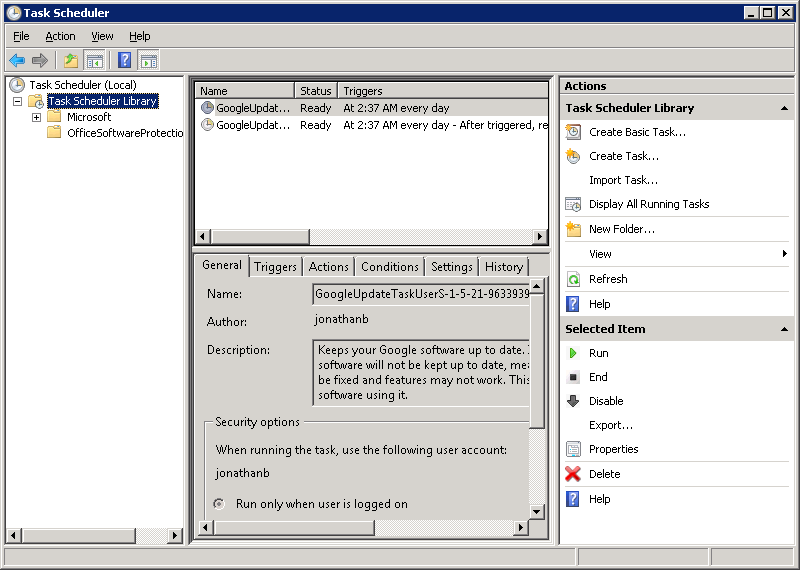 Be sure to select the option to “Run whether user is logged on or not” to ensure the task still runs after you log out. 3. Click on the Triggers tab and click on New. 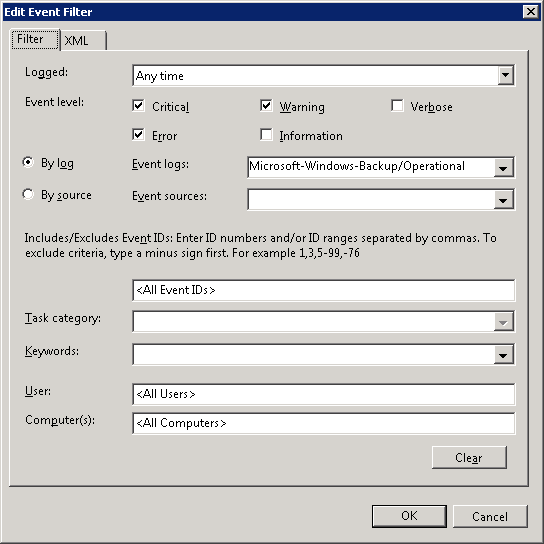 Select “On an Event” from the drop down. Choose “Custom” under Settings. Select all of the event levels except “Information” and Verbose”. Then select “By log”. 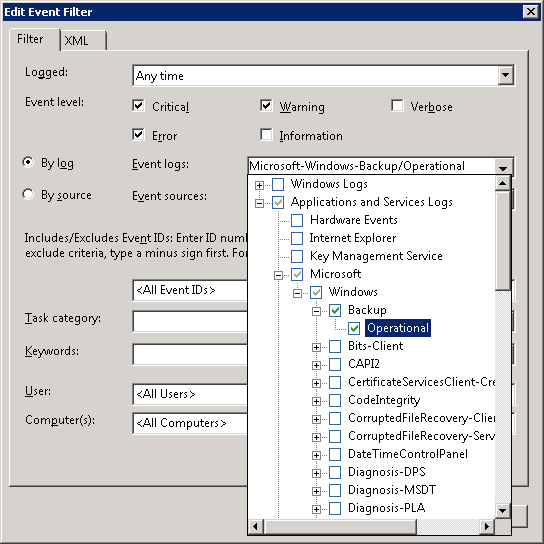 In the Event Logs dropdown, open Applications and Services Logs, then Microsoft, then Windows, then Backup, and choose Operational. Press OK and OK, put in your authentication, and you’re done! 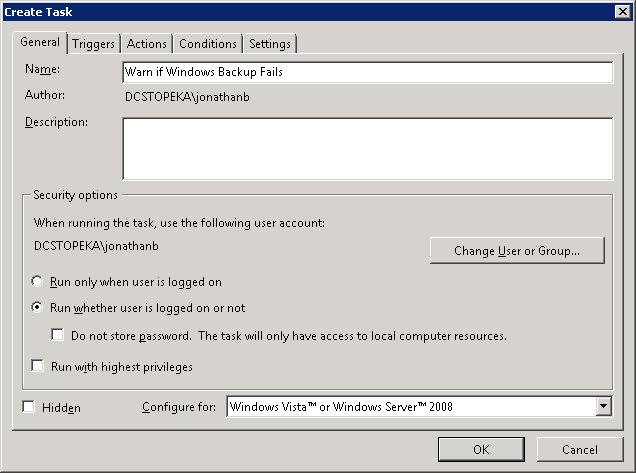 Const EmailFromName = "From Name"
EmailSubject = ServerName & ":  Windows 2008 Backup has failed"
"on " & Date & ", " & Time & " ." Const cdoSendUsingPickup = 1 	'Send message using local SMTP service pickup directory. Const cdoSendUsingPort = 2 	'Send the message using SMTP over TCP/IP networking. objMessage.From = """" & EmailFromName & """ <" & EmailFrom & ">"
' Now send the message! and we’re in! I will try to get permission from Paul to rewrite all of this step-by-step in detail. 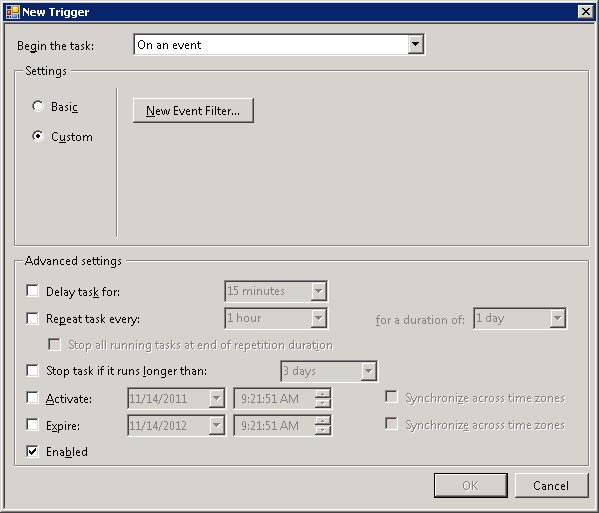 For now, the idea is, we set up a “scheduled” task which triggers on the above event list (and not by a timed schedule). We go to Server Manager, Configuration, Task Scheduler, Task Scheduler Library, Microsoft, Windows, and Backup, and create a new task, beginning the task on an Event, settings Custom not Basic, with a New Event Filter; set it “By log”, and drill down “Applications and Services Logs”, “Microsoft”, “Windows”, “Backup”, and choose “Operational”. Then, set its “Action” is the above-mentioned VBscript. And if we want a separate notification on successes, we can make a copy of the VBscript with a “success” message, and instead of the above error event list, we just use event 4. 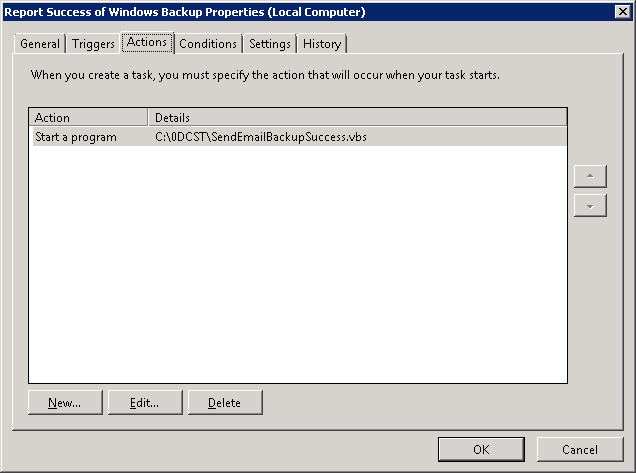 Windows Backup on Server 2008, is very different than previous backup tools provided by Microsoft. It is block-level, meaning that it handles only whole volumes (drives) at once. But it works very well, it has much lower impact on resources. It uses VSS as its basis. Data difficult to identify, but useful for setting up monitoring, follow.